When a leading authority on French Impressionism takes time to visit Ukraine to see the original works of a Ukrainian painter virtually forgotten until recently, you know something significant is happening in the art world. We are currently witnessing the rediscovery of the Kharkiv artist Mykhailo Tkachenko, and the process could play a meaningful role in helping Ukraine to reconnect with the European cultural mainstream. The irony, as Professor Rubin points out, is that Tkachenko was well known and appreciated at the end of the nineteenth century in both France and the Russian Empire. However, he subsequently vanished from the art scene for many decades, only to resurface relatively recently. In essence, Tkachenko was a victim of changing political tides. He died at the relatively early age of 55 in 1916 as a respected member of the Impressionism movement. However, following the Bolshevik Revolution, the Soviet regime rejected the “decadent” art of the “bourgeois” world. This left the artistic legacy of Tkachenko consigned to oblivion. Meanwhile in Paris, Tkachenko’s works were absorbed into private collections and there were no follow-up exhibitions or publications to sustain his reputation. A painter of greater skill, Tkachenko was very versatile. His talent initially earned him a place at the Saint Petersburg Academy of Arts, where in 1888 he won the opportunity to study in the world’s artistic capital of that time – Paris. Having trained in the realist tradition while in the French capital, he soon embraced avant-garde Impressionism and gradually won recognition as a worthy colleague of French icons such as Manet, Monet, and Pisarro. Tkachenko settled in Paris in the artistic quarter of Clichy, though he frequently returned home in order to carry out commissions for Russian patrons in the more traditional style. The French press regularly acclaimed his Impressionist artworks. He also won two gold medals for his artistic endeavors. Le Figaro, according to Rubin, hailed the Ukrainian artist as one of the best Impressionists of the day. As the American specialist notes, there were two sides to Tkachenko’s career. Through his contacts in the Russian imperial capital, Tkachenko secured work as an official painter for the Russian Imperial Navy. He frequently returned to paint magnificent marine scenes, portraits of military vessels, and landscapes of the Crimean coastline. His reputation in official circles was such that when Tsar Nicholas II visited France in 1909, he brought two works by Tkachenko as presents for the French President. 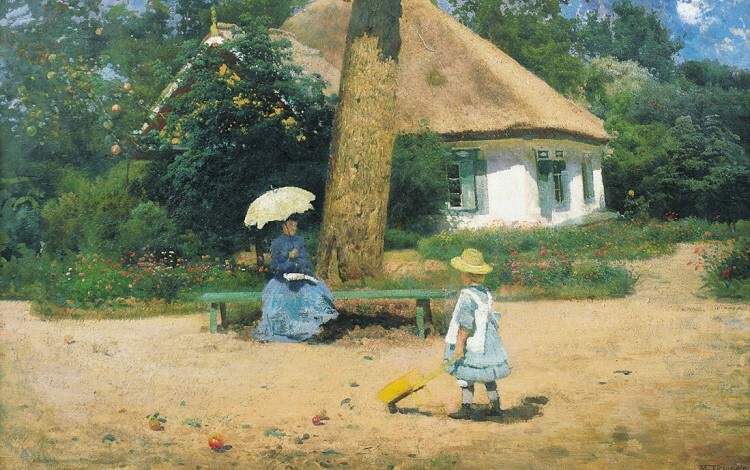 Tkachenko also brought Ukraine to French Impressionism. As you look at the catalogues and reviews of the many exhibitions and works from his 20 years in Paris, it becomes clear that most of his art drew on Ukrainian themes. Art critics also noted this source of inspiration and routinely identified Tkachenko with Ukraine. As if to illustrate this connection, the two works for which he won gold medals in 1911-12 were entitled “In Ukraine” and “View of Poltava Province”. Thanks to a few specialized publications that have appeared in Ukraine since independence, together with the dedication of several museums and private collectors, the achievements of Tkachenko are gradually gaining recognition in this homeland. The appearance in 2010 of Dmytro Holets’s pioneering album “Mikhail Stepanovych Tkachenko” was an important contribution to this process. The task now, as Professor Rubin explains, is restoring Tkachenko’s reputation worldwide while emphasizing his Ukrainian background. Credit for beginning this work and engaging the American specialist goes to the indefatigable Bate C. Toms, doyen of the business and legal communities in Kyiv and President of the British Ukrainian Chamber of Commerce (BUCC). A friend of Rubin’s from student days, Toms persuaded the expert to come to Ukraine and judge Tkachenko’s work for himself. BUCC also organized a lecture by Rubin at the Hyatt Hotel in Kyiv, together with an improvised but illuminating mini-exhibition of Tkachenko’s works. Efforts to raise the profile of Tkachenko internationally are now slowly beginning to gain momentum. Professor Rubin has agreed to assist with the production of an initial catalogue of the Kharkiv artist’s works. The BUCC is also cooperating with leading Ukrainian Auction House “Korners” to produce, in cooperation with Professor Rubin and others, a second edition of the book by Holets on Tkachenko. 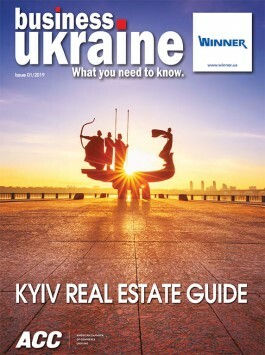 This time, the publication will be in English and Ukrainian as well as Russian. Meanwhile, preliminary planning is underway for ambitious Tkachenko exhibitions in Kyiv, London, Paris, New York, Chicago and Toronto. At a time when Ukraine seeks to reengage with the European cultural mainstream, this forgotten figure from the Impressionist era could yet play an important role in the country’s cultural diplomacy.